Activated Water, healing water, Activation of water from cosmic! Drinking of the activated water: The Energy Tlisman is able to transfer strong energy vibrations of the Earths' natural forces and spiritual spheres of the universe to enable everyone to receive these high quality energies. Water activated by the table has a deep regenerative effect. The minimum recommended daily intake (RDI) of the activated water is 3 glasses with a volume 3 decilitres - about ½ pint it is 0,08 US gallon each a day. For those suffering a more serious disease or low energy levels may want 6 to 9 glasses a day. Activation of water - duration and procedure: it is recommended to use water with highest possible quality. 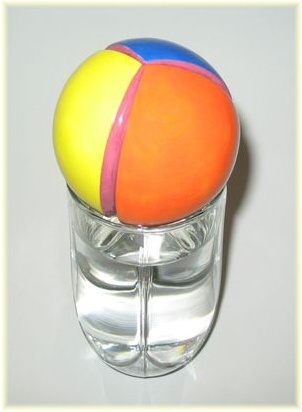 Place the ball onto a glass with its grooves heading upwards (axis perpendicularly to the ground). A glass or jug with a narrow bottle neck (A carafe for wine) so that the ball does not fall into it and does not touch the water surface. The duration of activation for one glass should be at least 10 minutes. Other amount requires a longer time (1lt – 30 minutes). The activated water stays fresh for a long time upon the activation, but it is suitable to leave the ball on the glass permanently. This always guarantees the full potential of the activation. Split up daily dosage of this energized water into more smaller parts and try to increase the amount of the water gradually. For example, have a glass a day for the first three days. Then add one more glass a day. Should strong reaction occur, have a break and decrease the amount of water. ET enables us to create unlimited amounts of regenerating, energizing activated water completely free of charge! ET has been made exclusively from approved and non-toxic materials and technologies. The activated water is absolutely harmless. 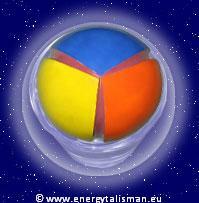 Its energy activation can be created only by the influence of spiritual energies, colors, and wavelengths on water. We can combine drinking of the activated water and the direct action. If we drink the water regularly we can reduce or skip the direct action and vice versa. ET - Energy Tlisman: The source of activated water for Your Health, for Your Life.